Find hotel near Gold Coast Convention And ..
Gold Coast Convention and Exhibition Centre, located just 500 meters from the sands of Broadbeach, is Australia’s largest regional convention centre. Opened in the year 2004, GCCEC is known for hosting some of the world’s biggest names from the music and entertainment industry. With over 10,000 square meters of exhibition space on the ground floor, the convention centre consists of 4 halls, 4 registration offices, 22 meeting rooms and 12 kitchens for catering, and is capable of accommodating up to 6,000 people. Ticket prices vary from event to event. By Tram to Broadbeach North station. How popular is Gold Coast Convention And Exhibition Centre? People normally club together Coolangatta Art And Craft Makers and Hinze Dam while planning their visit to Gold Coast Convention And Exhibition Centre. Been there yesterday for the first time for Supanova. It was amazing. It is huge and you can easily get lost but plenty of staff to help. The car park was full when I got there in the morning but some spots freed in the afternoon and again the staff was really helpful. 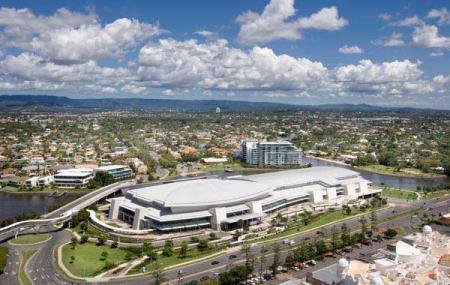 Adjacent to the Star Casino, is the Gold Coast's multipurpose Exhibition and Convention Centre. We visited for the first time since it was built and were impressed. Saw the Australia Decides Eurovision Concert from seats that offered an awesome view of the stage and the TV and sound boxes in action. Most seats with a great view. Particularly liked the covered walkway that links the centre with the Star Hotel an Casino. Will visit again. Excellent facilities and venues for concerts and performances large and small. Extensive parking at very reasonable rates. Easy access to restaurants close by for pre and post show dining. Light rail team stops right outside the door. We attended comicon 2019 at the convention centre. We got there early in the morning and parking was full. Fortunately we found parking across the road, entry wasn't to expensive. Was rather busy but had plenty of things to look at. Great day out for a family with older kids..